It was established on Magha Puja Day, 20 February 1970, on an eighty-acre (320,000 m²) plot of land donated by Lady Prayat Phaetayapongsa-visudhathibodi. The site, sixteen kilometres north of Don Mueang International Airport, was originally called 'Soon Buddacakk-patipatthamm'. From acidic paddy fields, a woodland was created: a parkland for meditators. The foundation stone for the main chapel laid by H.R.H. Princess Maha Chakri Sirindhorn on behalf of H.M. the King in December 1977 marked the official foundation of the centre as a temple - Wat Phra Dhammakaya. The Main Chapel was completed in 1982 and the ceremony for the allocation of the chapel boundary (sima) was held three years later. 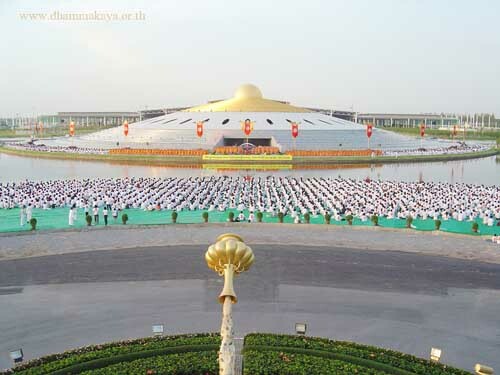 While the temple was under construction, the Dhammadayada ordination scheme gave training to hundreds of university students, a steadily increasing number of whom swelled the number of residents in the temple community.